Oh Diabetes. Dear, Dear, DEAR Diabetes. This was to be your day. The day the spotlight was to shine all over your youness. The day when you would think you’d want to look your best, you know, have a fresh-faced glow about you, especially in the face of flashing lights and snapping cameras. You’d think you’d want to show the world what a lowly medium, such as myself, can do with your greatness jabbed into my side. But you’ve never really been an easy one have you, never really gone with the flow, why start now, why put on a phoney face for the reporters, hey. Nah, you wouldn’t do that. Sure you had me fooled, weeks of cooperation, nary a hiccup to be heard. But that was your plan all along wasn’t it? I had just sat down to my desk, had just lifted my steeping cup of matcha for a quick sip before the phone interview was to begin, when you and your frienemy greatness struck once again. There was a loud clicking noise my ears couldn’t quite detect, like the sound of an old grandfather clock when you’re trying to sleep. I thought it was coming from the bathroom, but just as I was about to get up, I felt a vibrating sensation rubbing against my back. When my hand reached around, the only thing there was your insulin pump. Before I could even contemplate what was going on, the phone rang. And you were laughing weren’t you? I muddled my way through the interview, talked in nonsensical sentences filled with uhms and ers, I told the daily newspaper reporter all that I had achieved athletically, was it with you, or despite you, I can’t recall, all the while wondering what the hell you were doing. You made it hard to forget what with starting to blare a high decibel alarm on top of the clicking and vibrating. The interview lasted just shy of a half an hour. When I hung up the phone, I saw the alarm message on the pump, no delivery, call service. And I could hear that cackle of yours. 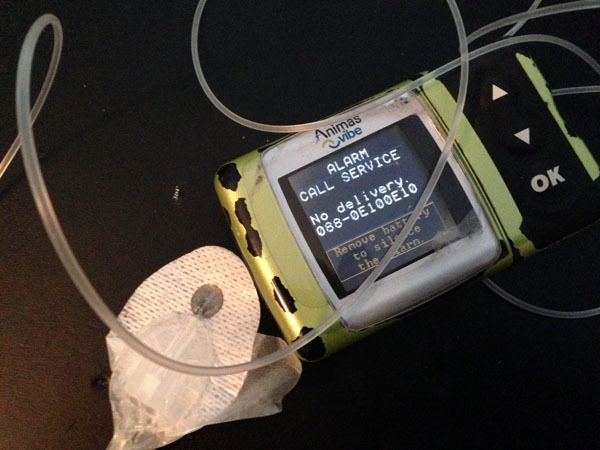 I had five minutes, five minutes, to dig out my old backup insulin pump, program her, load her up with insulin and get connected to my infusion. Any other day I would have waited. Any. Other. Day. But this day, this day was all about you, and the fact I wear a bloody insulin pump while running. The photographer was on his way, scheduled to be here in mere seconds, I could not exactly show off an out-of-service pump now could I? But hey, guess what jerk face, it was actually ME who had the last laugh. I made it out to that photo shoot, my cheeks all aglow, backup pump attached, dosing away, and it was my greatness they wanted – not yours. This entry was posted in Diabetes, Running and tagged broken insulin pump, diabetes in the media, Insulin pump, running with diabetes, Vancouver Sun. Bookmark the permalink.